Beach Block Spectacular BY WOERNER CUSTOM BUILDERS – SPACIOUS 2-Story Home features 4 Bed, 2.5 Baths with Open, Reverse living Floor Plan. 1st Floor – 3 BR, Family Room with wet bar. Large Rear Deck on first floor. 2nd FLOOR – Gourmet Kitchen W/GE Cafe SS Appliances. 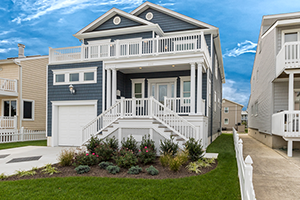 Dining Room, Family Room /Sliders to a Large Front Deck, Master suite w/large master bath and huge walk-in closet!Walk to the ocean, sea wall & Brigantine’s Wild Life Observatory…Island living at its finest..Live at Brigantine Point! !